This is one of my favourites: tuna pizza. Yes, I am vegetarian but I do eat fish. I use my bread baking machine for making the yeast dough, because it means I really have no work. My trick is to prepare the dough the evening before I know I am going to bake pizza and put it to the refrigerator for the night. The pizza dough tastes than better than when I prepare the dough before baking. The recipe for the dough is very easy. If you have a bread baking machine, just follow the instructions. If you don't, so prepare it as you would usually prepare a yeast dough. Mix the yeast with the water and 1 teaspoon sugar. Put it to the machine. Add the flour and the salt and olive oil. Choose the dough programme. 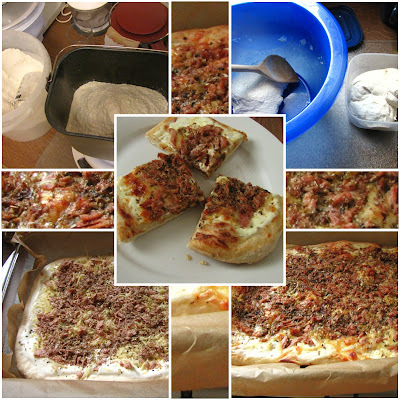 It should be ready after around 1.5 h.
Put the dough for around 12 h to the refrigerator. Use only one part of the dough for your pizza, the other one you can deep freeze for the next time. Use whatever you want as topping for the pizza. Bake it around 20-25 min.